In the ongoing debate over climate change, it's at times a good idea to check in with historial predictions made by climate modelers and see how well they have been able to predict global warming – which is exactly what a pair of researchers at the Koninklijk Nederlands Meteorologisch Instituut (KNMI) have done. 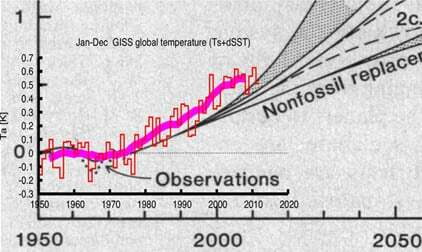 Geert Jan van Oldenborgh and Rein Haarsma "stumbled across" – their words – a paper in the August 28, 1981 issue of Science, written by a septet of climate modelers, which modeled a number of scenarios that projected global mean temperatures up to the year 2100. The lead author of that paper, "Climate Impact of Increasing Atmospheric Carbon Dioxide", was the now-famed and/or now-reviled James Hansen, currently working at NASA's Goddard Institute for Space Studies (GISS). "It turns out to be a very interesting read," Oldenborgh and Haarsma say of the paper in their blog post on RealClimate. Oldenborgh and Haarsma remind their readers that when the 1981 paper was written, temperatures in the northern hemispheres were declining, and global mean temperatures were below their 1940 levels. Despite those facts, the KNMI researchers say, the paper's authors "confidently predicted a rise in temperature due to increasing CO2 emissions." The paper's authors assumed that no action would be taken to rein in CO2 emissions until at least 1990, and so their projections don't begin to deviate until that date. 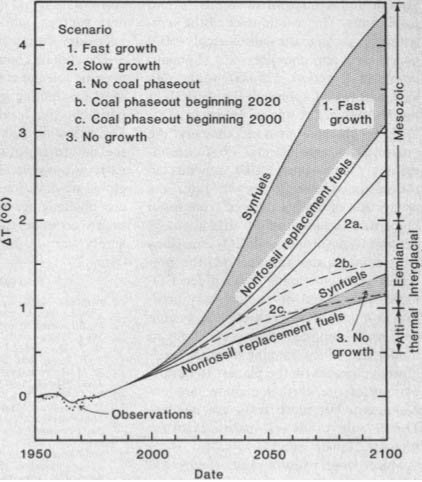 After 1990, they applied different sets of variables to their models, ranging from a worst case in which coal-derived synthetic fuels replace oil and gas and there is a large increase in fuel usage, and a best case in which non-fossil fuels are the replacement and there is no growth in their usage. Oldenborgh and Haarsma took the 1981 paper's projections, and overlayed upon them known temperature increases since 1981 as determined by the GISS Land-Ocean Temperature Index, and using the KNMI Climate Explorer research tool. "Given the many uncertainties at the time, notably the role of aerosols, the agreement is very good indeed," write Oldenborgh and Haarsma, comparing the results favorably with the far more sophisticated coupled-model CMIP5 simulations. If you're not familiar with the RealClimate blog, here's how they describe themselves, in part: "RealClimate is a commentary site on climate science by working climate scientists for the interested public and journalists. ... The discussion here is restricted to scientific topics and will not get involved in any political or economic implications of the science." Refreshing, if true.